Maximum machine building competence combined with production “Made in Germany” are guarantees of safe and reliable conditioning in the standard pressure range from 50 bar to 350 bar. 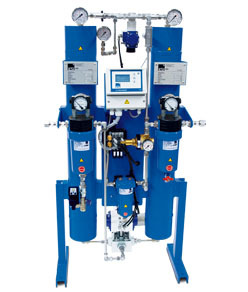 The ECOTROC® ATK-HP product line builds on the globally successful ECOTROC® ATK family of adsorption dryers. Consequently, both the design and the process technology of the ATK-HP product line are already tried and tested. Perfected with high-pressure components in top industrial supplier quality, the result is an exemplary and compact system solution with the exceptional value for money typical of KSI.